After flying out west to hike Zion, Bryce, Grand Canyon, Canyonlands (Needles and Island in the Sky), Arches and finally to Rocky Mountain National Park, we only made one wrong turn… and it turned into the best wrong turn of our lives. It was 2 days before we were about to leave to return to Connecticut when we passed a piece of land bordering Rocky Mountain National Park. We stood on top of that barren piece of land and said, “This is it!” We had not planned on buying or building a house… we had only come to hike the National Parks for 3½ weeks. By the time we left RMNP, we had decided to build a home in Estes Park. Sometimes the most life altering decision turns into a very fast decision. It doesn’t happen that often, and we are very happy that we didn’t miss the opportunity. One year later, our home was finished and now we are your neighbors here in Estes Park. 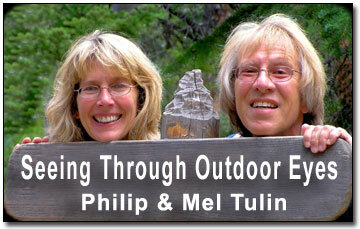 We have lived an exciting outdoor life of hiking, snowshoeing, downhill skiing, surfing, ocean kayaking, birding, etc. and we have many stories of our outdoor adventures. Our home has a custom designed outdoor “adventure closet” built to store all of our outdoor adventure gear. We even have duplicates of some of our equipment for our children, grandchildren and guests. In fact, as our neighbors jokingly say, “The closet looks like a well equipped outdoor adventure retail store”. We couldn’t have asked for better Estes Park neighbors as it seems like we’ve known them for the last 20 years. We’ve already taken numerous hikes with them and have enjoyed the town to the fullest. David, a park ranger for 27 years, has a wealth of knowledge on wildlife and wildflowers which he constantly shares with us…. and we take it all in like a sponge. We’ve met many people in the outdoors and some of them even have become mentors to us. From out of the Endovalley forest, two men appeared with binoculars and camouflage. I said to the tallest man, “Where are the best places to go for birding?”… as I figured he was a birder since he had binoculars. He said, “My book indicates all the best places to go birding.” I replied, “I just happen to have your book in the front seat of my car. Would you autograph your book for me?” I now send Scott all our unidentifiable bird photographs by email and he always responds with the correct bird identification. Gary, who was with Scott, is also a master birder. It always amazes us that no matter what trail we take, we seem to bump into Judie. Each time we meet her on a trail she says, “We shouldn’t be meeting this way!”… and she laughs as she says it every time. She just helped us identify a couple of butterflies that our field guide book didn’t have. Judy is a master birder, too. We even bumped into her on the top of Trail Ridge Road early one morning when we went to photograph the Ptarmigan before sunrise. Everyone in town has welcomed us with open arms and we really appreciate it. Now we want to give back to the community with our “Seeing Through Outdoor Eyes” weekly column in the Estes Park Newspaper. We can’t say enough about Kris and Gary, who publish this great newspaper. They have already published numerous photographs of ours and they have now given us the opportunity to write our column about 2 topics that we really enjoy. Our “Seeing Through Outdoor Eyes” column will include educational articles about outdoor adventure and outdoor photography: hiking, snowshoeing, kayaking, how to choose & take care of outdoor gear, how to identify birds, wildlife, butterflies, trees, flowers, how to track wildlife, how to use your 5 senses, outdoor adventure expeditions, bird photography, wildlife photography, landscape photography, macro photography and so much more. We really get excited thinking about all the topics we want to share with you. We will even teach you how to take award winning outdoor photographs with any inexpensive camera (and hopefully we won’t get too many letters to the editor regarding that statement). Some of our well known friends in the outdoor adventure field might even drop in to the “Seeing Through Outdoor Eyes” column for a “guest writing” appearance. Every once in a while, we’ll have a contest for someone to win an “Outdoor Eyes” hat or some outdoor gear. We realize that not all topics will be of equal importance to all of you and that some of the information might already be known and understood. But, if “Seeing Through Outdoor Eyes” motivates you to explore a new outdoor photography technique or seek an outdoor adventure, then it has fulfilled its purpose.